The Ultimate Superstick is a third-party accessory designed by Beeshu for the Sega Master System. A slight variant was brought to France by a different company as the Fast Fire Turbo. 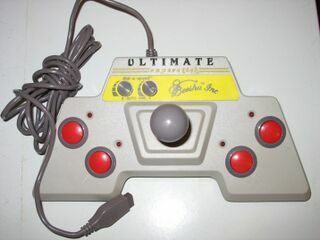 The Ultimate Superstick is an arcade stick peripheral, with buttons on either side to accomodate both left handed and right handed players. It also has turbo functions. A similar stick was produced for the Nintendo Entertainment System. The Remote Ultimate Superstick is a wireless version of this controller. NEC Retro has more information related to Ultimate Superstick.